I have always been in awe of people who are able to come up with fabulous, eye-catching tag-lines and images for a product or to be precise for their books. People like you and me who are able to think unique ideas and put in relentless efforts to showcase their work in best possible ways to their end customers. In other words market their works to the consumers, a field which is increasingly becoming the most crucial in current scenario. I invite author Sundari Venkatraman to throw some light on the complex subject. Sundari is a novelist, and a role model in taking her ‘works of art’ to the masses. She has recently released her new book ‘The Madras Affair’ published by Readomania which is her fifth published book. I hope all the authors would find something to takeaway from the pearls of wisdom. Thank you Ruchi Singh, for the opportunity to write about this topic on your blog! When we say Indie Authors, I presume ebooks as that’s the first and foremost step. But as a prequel, it’s very important to create your presence; leave an e-footprint across the internet. Like Twinkle Khanna’s book took off like a rocket from Day One because many of the public have already read her columns and are familiar with her writing style. So, I would say that having a blog helps set up your fan base. Of course, you need to promote it and that’s where Facebook, Twitter, Google+, Pinterest and the rest come in. This is one aspect of marketing. But there’s another, more important one. What’s the motivation for other bloggers, writers (well, those will be your most important reader base; who will also help spread the word) to read your work, comment and share? It’s elementary, my dear Watson! You need to read their work, comment and share. This is a sure-fire way of setting up a following. It’s not easy, but it’s not difficult either. This also gets you to make contact with like-minded people. Who better than these to read and share your books? Once you set up your book on an e-shop, you share the link on social media. You give free copies to interested people to read and review on Goodreads and other platforms. Be clear about your target audience. For example, a young author approached me to read and review her book. She insisted that it was a romance and will definitely interest me. But sadly, the book has been written targeting young adults. It failed to interest me. But that doesn’t necessarily mean the book is not good. It’s just that she’s chosen a wrong person to read and review it. This is a very important point to take note of. Find out the right audience for your book before approaching reviewers. During the past two years when I have been writing, publishing and promoting my books as an Indie author, I have tried and tested a lot of stuff; though I publish only on Amazon. I don’t really know about the other websites. As for marketing, there is no right or wrong way – but there’s no escaping it. It’s easiest when you promote your own work as you know it best. But then again, people do hire experts to do it. But I don’t find the returns worth spending too much money on marketing. A recent tool that I discovered is the use of Facebook for Business. It’s a great way to market as it reaches a larger audience; an audience who is not within your small circle. It’s basically that new people get to know about your books. The cost is negligible and there are no hard and fast rules. You can market for 2-3 days in a month for about Rs. 500 (you can fix a budget) and wait to see if there’s an impact. This was really great, thanks a lot Sundari! 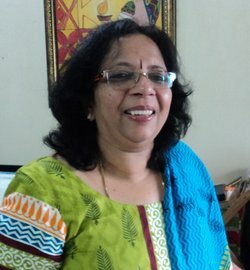 Sundari Venkatraman writes novels in Romance genre. She also blogs voraciously, writing on many different topics – travel, book reviews, film reviews, restaurant reviews, spirituality, alternative health and more. In 2014, Sundari self-published The Malhotra Bride (2nd Edition); Meghna; The Runaway Bridegroom; Flaming Sun Collection 1: Happily Ever Afters From India (Box Set) and Matches Made In Heaven (a collection of romantic short stories). 2015 brought yet another opportunity. Readomania came forward to traditionally publish this book – The Madras Affair – a mature romance set in Madras. In my opinion, good content is the entry criteria for this post.Secondly, we can't control who likes what, we can only do our job well.Thanks for buying my book. Hope you enjoy the story. Lovely Interview Ruchi & Sundari ! All the Best ! Keep writing !